Supergirl of Lorien: Happy 5th Anniversary, lotro! 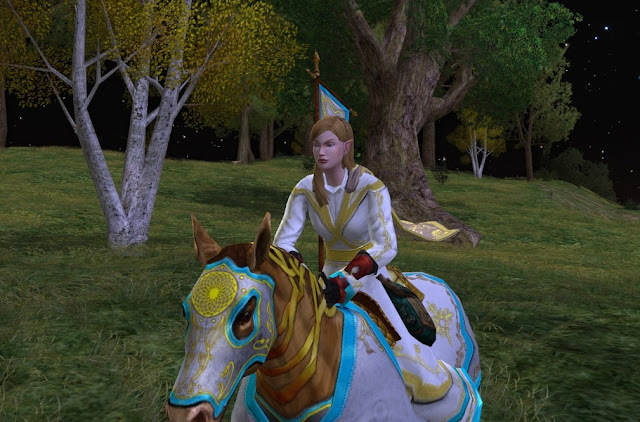 Happy 5th Anniversary to lotro! And Thank you all for visiting Danania.net! Last Friday, the site saw its 10,000th visitor, which is absolutely amazing to me as the site is right at 2 months old. Thank you! спасибо! 谢谢 Danke! Salamat! Bedankt! Merci! Thanks, eh?! (...to my Canadian friends). 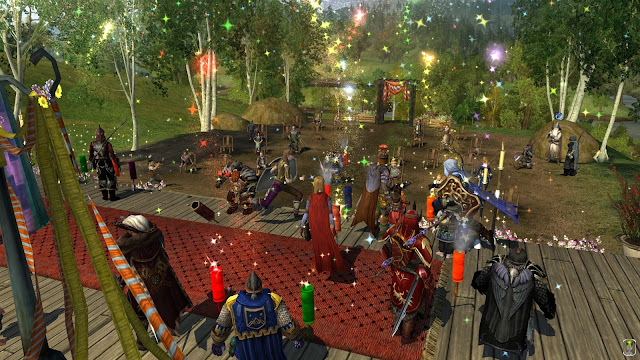 There is so much excitement in Middle Earth and the Anniversary party is in full swing! It is such a hit that the party's end has been extended from April 30 to May 9. I have been having a great time and I hope you are also! Often, when festivals start, I rarely leave to do anything else. 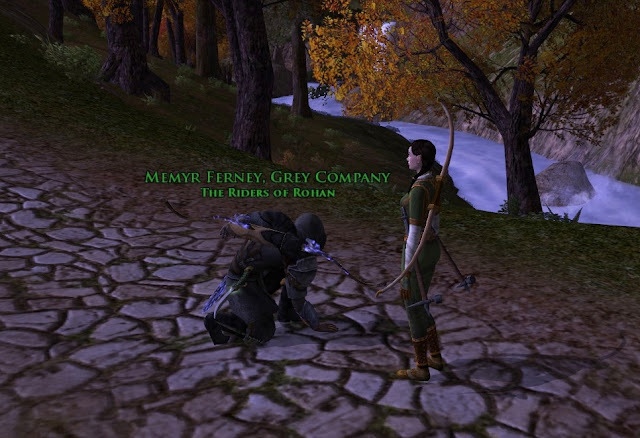 This time my friend Lartessa set up a Helegrod run and I couldn’t pass that up (still need to kill Thorog, but at least now I am eligible to open the Dragon Wing when the opportunity presents itself), and Nimitar organized a visit to Ost Dunhoth and I had never had the opportunity to see much of that and we totally ran the tables (I got some good pictures for another post). 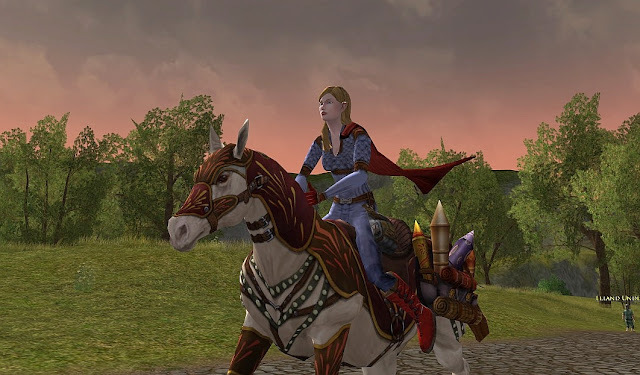 First of all, when planning to maximize fun, I always visit party planner Goldenstar at casualstrolltomordor.com . I would say I just visit for the highlights, but in reality I study and absorb everything she posts like I am preparing for the medical boards. 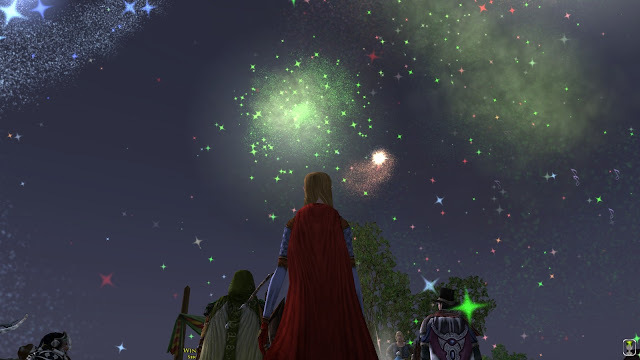 One of the best things about the Anniversary festival is obviously the fireworks. Middle Earth has had fireworks before but nothing on the scale of what came with the Anniversary party. 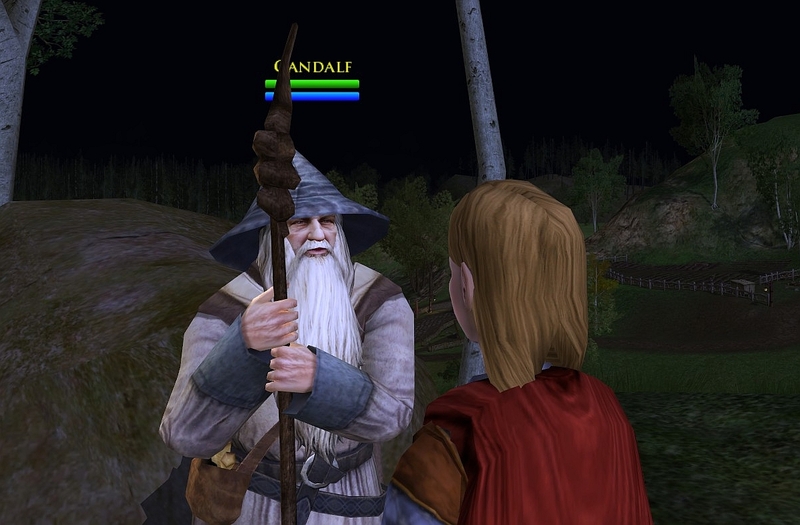 I wanted to ask my friend Gandalf about it, but he seemed preoccupied, like his mind was elsewhere. He muttered something about hidden hobbits, but it was drowned out by the blasts and flash of fireworks around us. So we just stood and enjoyed the festivities. 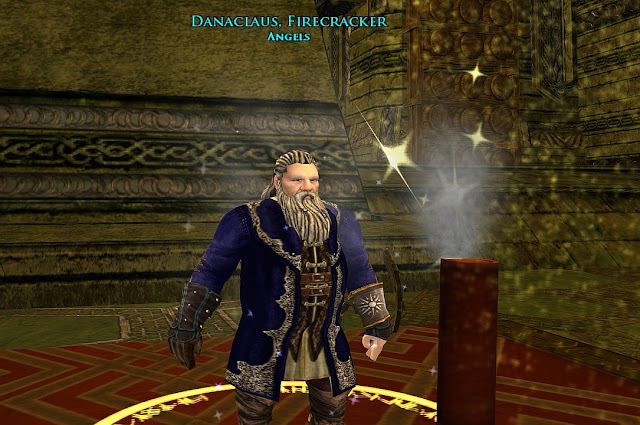 One of the Anniversary quests, Firework Explorer, takes you on a tour to launch fireworks and bring festivities to other parts of Middle Earth, which earns the title “Firecracker”. 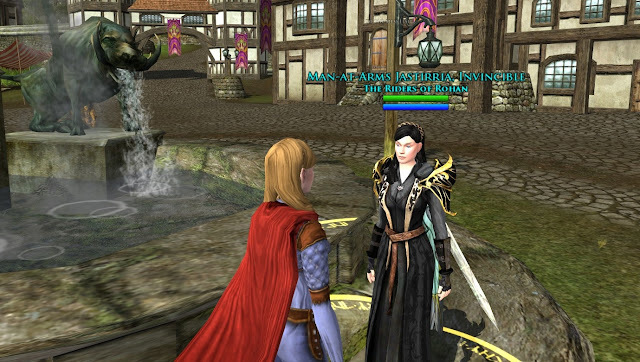 The most far-reaching place is Elrond’s house in Rivendell. That is an easy leap for a Supergirl but was no small task for the lil danas. Fortunately, there are kind hunters and captains around to help out. 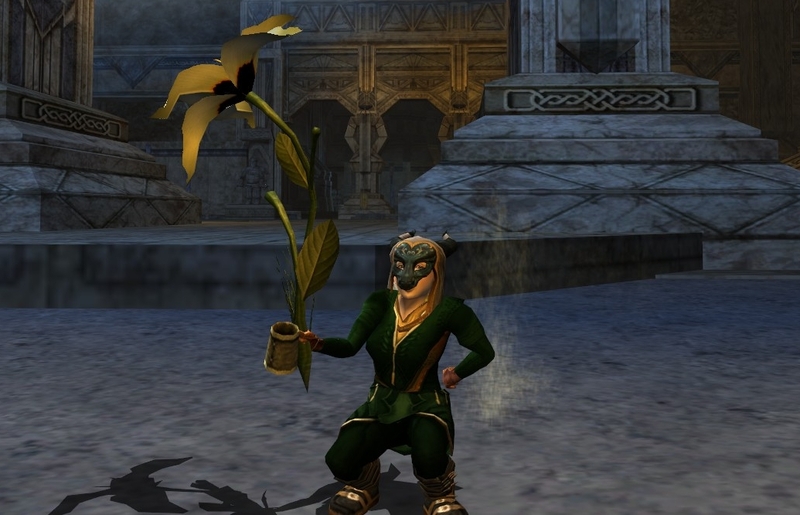 Memyr delivered all the lil danas safely to aid in the spreading of party cheer. Whew, just lost a contact lens? When Danadelion saw Rivendell for the first time, it brought back memories of just how lovely it is. 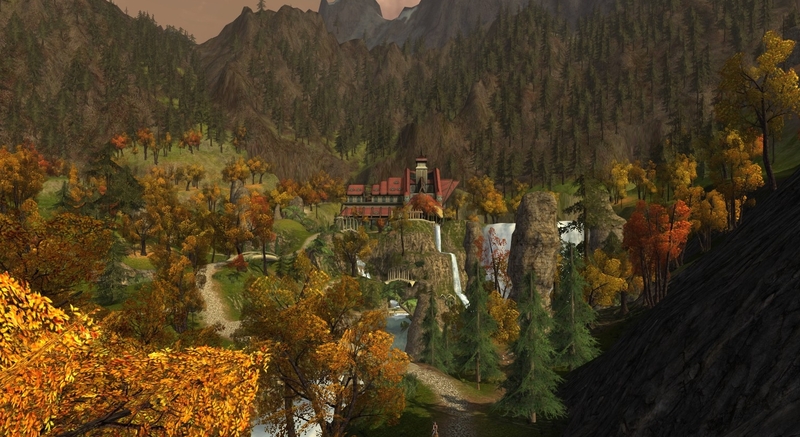 Imagine fighting through the Trollshaws, hurriedly crossing the Ford of Bruinen, arriving at Rivendell, and finally seeing this breathtaking sight? We had a great time at the beer brawl! There are three versions: Beginner (1 token), Intermediate (2 tokens), Expert (3 tokens). As long as there aren’t 50 people in the arena and you aren’t being targeted specifically to fail for some reason, the Expert version is totally achievable, gives the most tokens, and leads toward a deed which awards the title “Battered, Bruised and Contused” for 25 expert wins. For hitting others 200 times in brawls, you can earn the title “Clubber”. When you win on Expert, you glow for 3 minutes in the glory of your victory. 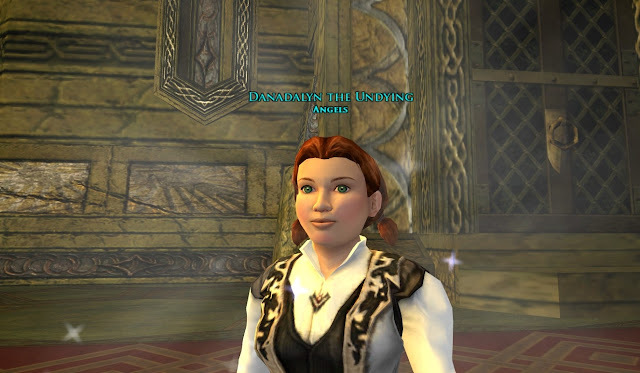 Danadalyn wears her glow proudly. When you launch 50 fireworks of one color, you get an Anniversary token. When you launch 50 fireworks of all 6 colors, you earn the title of “Master Blaster”. DanaClaus was having good fun whacking people around and working toward the Master Blaster title. The interim between brawls is a good time to launch fireworks. 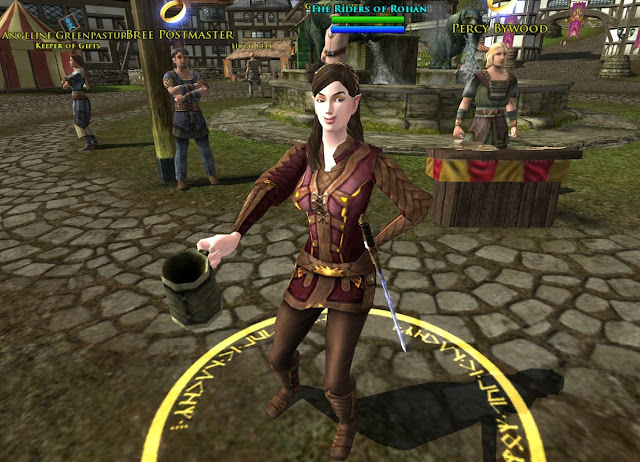 Macswife was one of the first people I met who had the /toast emote from the Lost Invitations quest. Ok, so it isn’t the most flattering picture. Lol. It is funny and the emote is a good one. Even the lil dana hobbits get into the act. Danaarodel, the “keeper of dana outfits”, dressed up in a green imp outfit complete with oversized flower from the spring festival and did a lil toast-ing herself. 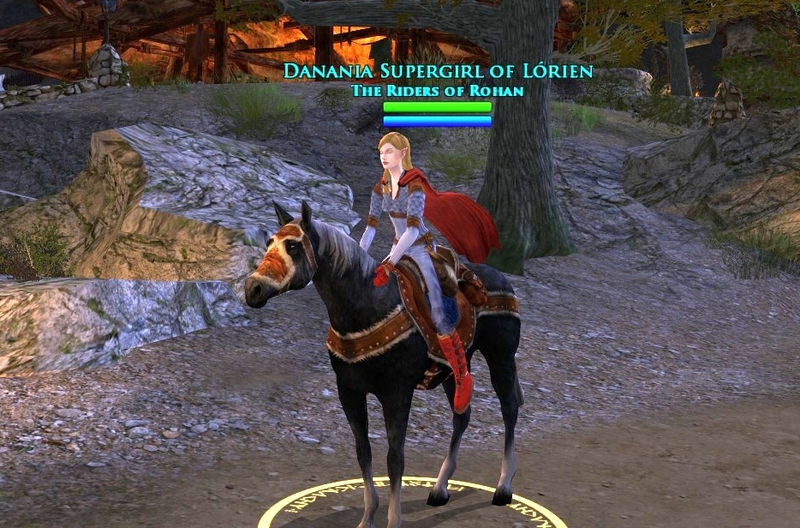 Danaish was the first lil dana to get a steed from the Lost Invitations. 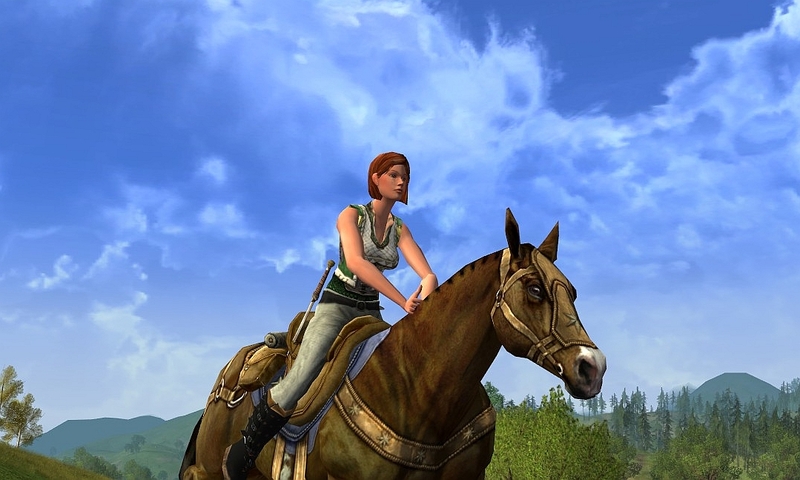 Here she is riding the “Steed of the Dusk Watch” (aka Warden’s steed). It has very nice leather-embossed tack. Definitely, one of the best things about festival time is that it brings people together, some of whom you otherwise don’t see often. Here is a shot of my friend Jastirria who I had not seen in ages. 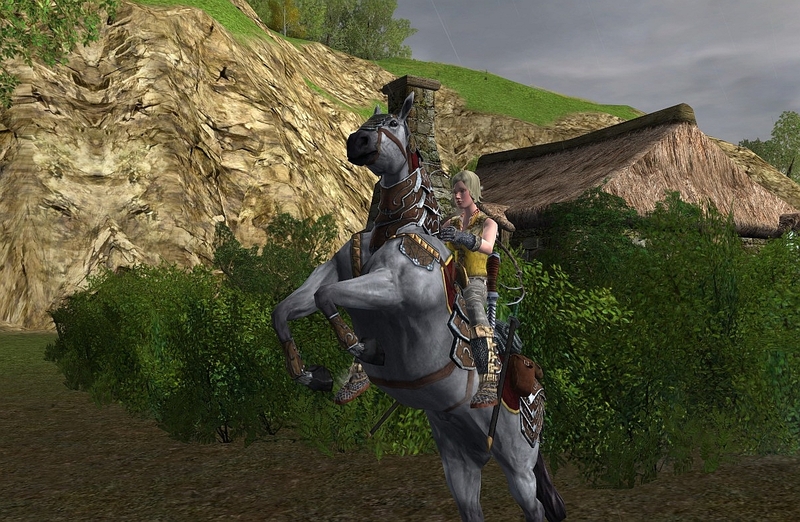 When I was a level 48 noob, Jas was the one who pointed out that I had to go get a Legendary Item (even though I had no idea what it was or where to get one) and came and picked me up out of Forochel and drop kicked me into the Gates of Moria. Some people and events you never forget. Thanks Jas. 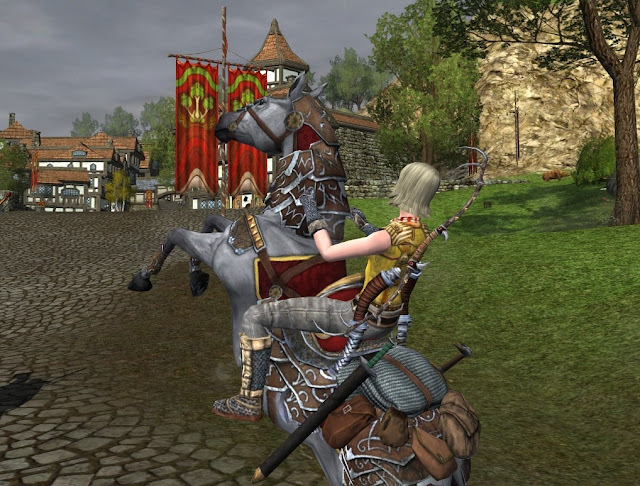 In the “can’t have too many steeds category”, we all went and got our Anniversary steeds. The new one is the Fireworks steeds. It actually does randomly shoot fireworks out the saddle pack. Alas, time to go to sleep and dream. May your festival spark and pop and your dreams be pony-filled. .... there will be a quiz later. Look everyone! THE world-famous Goldenstar showed up on my humble blog!!! But really and humbly... thanks Goldenstar! Your guides rock and define how I enjoy the game. I'm thankful for you. Thankfully, no serious monsters exist in the Danaverse. If you know it feels like a "new thing", know that you are not alone. Update 6 caused a lag issue that is being addressed. Glad that most of the RK changes appear to be fixes. I still haven't quite gotten used to the last revamp! I was feeling the same way about the RK non-activity in U7, Penglad. Change just for change's sake isn't a good thing. hehe. But, I did really like the Update 6 RK changes; many of them were very needed (I still want to revisit that revision, just need a few more hours in the day).